A bath, a good book and a cup of tea. Is there anything more luxurious? But a bath is just that -- a luxury. Indeed, not all of us (especially those in apartments) have a bathtub, which means the opportunity for a sensory bathing experience is slim. 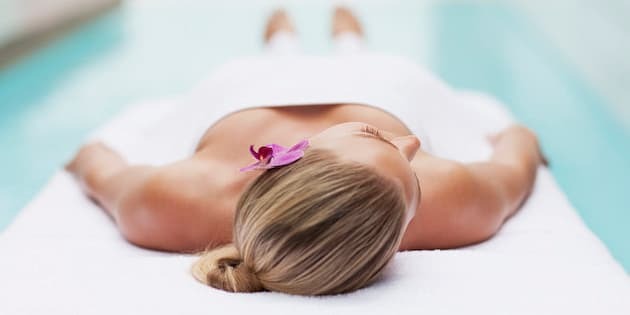 “There are a number of at-home treatments we recommend for our clients who don’t have a tub at home,” Catherine Lazarou, director of The Darling Spa in Sydney told The Huffington Post Australia. It’s simply about selecting the right essential oils, ensuring you are breathing correctly throughout the treatment and investing in a few key ingredients, like a Himalayan salt bar which assists with detoxification. “We often don’t have time to soak in a salt bath to unwind -- so the salt bar is the next best thing,” Lazarou said. Here, three spa treatments to treat yo'self with. “Himalayan salt bars contain loads of minerals that provide healing to the skin and therapeutic benefits for sore joints, aches and pains. This is not a soap bar that will lather up and get you squeaky clean but rather it’s used to give you a detox of your mind and body,” Lazarou said. Run a steamy shower. Without standing under the water moisten the bar and rub onto dampened skin in large circular motions for as long as desired. Can be used on the whole body except face. For sensitive skin or first timers wrap the bar in a light cloth to use it. Dry the bar off once finished (if it stays wet it will dissolve). “Sandalwood, rose, geranium, frankincense and myrrh is a combination of essential oils we use that will prepare you for the ultimate restful sleep,” Lazarou said. Light a soy candle (we recommend Espa Soothing Oil & Candle) at home in the area that is most peaceful and quiet where you can focus on breathing and resting your mind. With the oil, you can place a few drops on your temples or apply it directly to the body after a warm shower. Pop a few drops of oil into a bowl of hot water, stand over the hot water keeping your face at least 30 centimetres away from the bowl. Simple inhalations can calm the mind. A simple yet effective treatment (just ask Lauren Conrad who lists this as one of her fave at-home masks). The honey has natural antimicrobial properties and the banana will provide a plethora of vitamins including vitamins A and E -- which are said to be skin boosting. Chop banana into slices and then add to a bowl along with the honey. Using the back of a fork, mash the two ingredients together. Apply to dry, clean skin and leave on for 15 to 20 minutes before rinsing off with warm water.